No mining on the liberated territory of Xolobeni : African people have spoken! 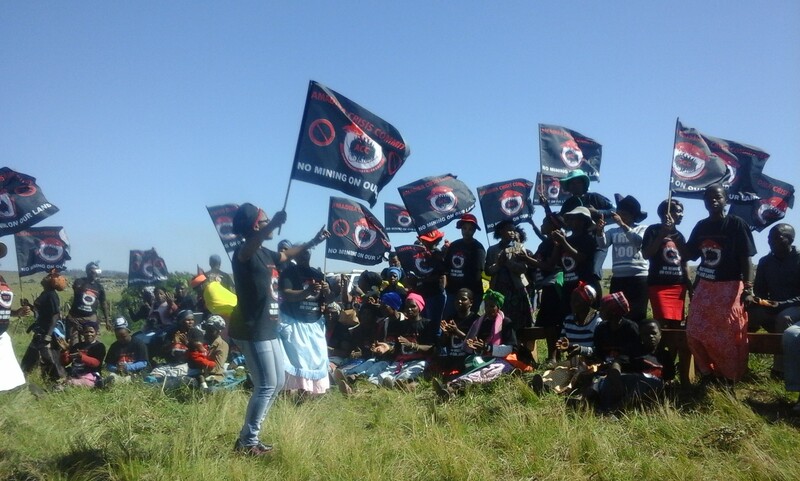 This article is based on the ongoing struggle in the Eastern Cape where our people are fighting a company from Australia, that since 2002 has been trying to get a license to mine titanium offshore in an area called Xolobeni in AmaMpondo Land. Most people are not aware or just recently became aware of the story with the revived attempt to get the license issued again. This has led to court cases and the recent one was the people versus the Department of Mineral Resources (DMR) in which the interview below took place after the court proceedings on November 22, 2018. Eighty seven percent of the land in Occupied Azania (South Africa) is in the hands of white people and only 13 percent in the hands of Africa. Xolobeni is part of the 13 percent and has never been colonized. The State of South Africa was designed in 1652 to protect the status-quo. The Uhuru Movement is organizing all Africans all over the world to take back our Africa from the hands of the few and putting it into the hands of the people. We are currently here in Occupied Azania building the working class Party that will guarantee that the people complete the struggle to free our land and put the people into power. The politicians in the African National Congress (ANC), Economic Freedom Fighters (EFF), Democratic Alliance (DA) and the rest have failed us and Xolobeni is one of many examples. The government has changed ministers, now Gwede Mantashe, and together with the company used different strategies such as giving to local people shares to the company, including a project to build a highway that will include two massive bridges right where the mine must be located. This is while there are no roads in the area and is going to affect many of our people. This matter of the highway is in court too. With Mantashe giving hope to the capitalists of giving them the license to mine, it ended at high court, where the court ruled in favor of the people. The minister’s claim that their government (the ANC) is the people’s government issued a statement angrily, saying there won’t be mining and development again in South Africa due to the court’s ruling. Opening the interview, I said, “Uhuru comrades. This is Zakhele from Occupied Azania, [I] am with Sibusiso [Mqadi] from Xolobeni in the Eastern Cape. "Sbu’ give us a little background of what has happened and the outcome of today’s court proceedings?" In Xhosa Sbusiso replied: “Kusukela ngo 2002 besilwa inkinga yento ye mine, imine endaweni yethu lefuna kungena ngeku ngekho emthethweni nangendlela yekuthi abafuni kunikeze bahlale amalungelo abo, ukuthi abahlali bazi kuthi yini into elungileyo kubahlali, and then kumhlaba kunento abangafuni kuyazi ye customary law ukutsi abahlali nabahlali abahlala keloyo ndawo abahlalakuyona (Since 2002, we have been fighting against a mine. The mine wants to start operation in an illegal way and they don’t want to recognize our rights to decide what is good [for] the community. Here, they don’t want to know that in the area, there is customary law that states communities and communities where they stay. If you are indigenous, you have a right to consent within your area and also that [includes] every project that they bring into your area. That is why today we are here in court to listen to the judgment and the judgment says that we have a right to say no in our community against any project that is not for the mine only, because there are also land rights and we have human rights as citizens of South Africa). Brother Sbu what are the challenges in our struggle that you have been facing since 2002? Ichallenge yekucala we are facing ikuthi sesiluze ama comrades amanyenti kukhulu, is almost 11 comrades abanye bayadubulwa abanye badliswe ipoison. If bakubona kutsi ustrong in the community they make sure kutsi usukile endleleni ngiyona ichallenge ekhugcala (The first challenge we are facing is that we are losing too many Comrades—almost 11 Comrades. Some Comrades are shot at and others were poisoned. “If they see that you are a strong leader, they make sure that you are no more. That is our first challenge). Yesibili esihlangene nayo ikuthi uphakathi now is divided into two parts, there is those people in Universities abathi bona balwela imisebenzi bakhodlwe kuthi siphile kanjani, ibackground abayibheki ibackground bona babheka amathuba imisebenzi. Which means ngendlela esiphila ngayo imphakathini kumina amathuba imisebenzi afana nama craps enyama, ngoba loyamhlaba usho something kuthina, usho into. Umubheka iSouth Africa yonke sibalwa kakhulu indawo esifana ne Xolobeni, thina sisenawo umhlaba ingikhwazi kuvuka inkomo yami idli khona yonke into idli khona. Kodwa kukhona umuntu namuhla angakhwazi khuthola lelo lungelo lelokhudla even organic meat and food nje etholakala nomekhipi lezozinto thina sizidla now and again into engafanekile ngize ngikhokhela imali. Ichallenge lapho esibhekana nayo ikuthi the time uphakathi ehlukene into two if there is traditional ceremony kumele wonke umuntu ahlangane khona endze yonke into asisakwazi kungenalana, asisangenelani because of the conflict (The second challenge we met is that now the community is divided into two, there are those who are from Universities that say they are fighting for jobs and forget where we came from, they don’t look at our background, they only look at the job opportunities.. "This means that in the way we live in the community job opportunities they are like scraps of meat because the land means a lot of things to us. "If you at look the whole South Africa there are very few places like Xolobeni, where we wake up and our cows and everything eat [is] in our land. "There are people who do not have such rights in the country, they can’t even enjoy organic food and meat that is available to us and we eat such food now and again. I do not [even] pay money for it. "The challenge we are faced when the community is split into two— if there is traditional ceremony where everybody must meet and do everything, we cannot interact with each other because of the conflict). Namuhla, [Today] you are happy with the judgment; it means the people have won, the war is complete or [can] we still expect the fight to go on? [I] am happy about the results today, but those results do not mean we can go and sit down as a community. “We still have a strategy because we know these people from DMR (Department of Mineral Resources) will come to appeal again. The ruling class are with the capitalists who have colonized Africa for more than 600 years and Xolobeni represents one of not many areas in the world that imperialists have failed to conquer. All African people must defend the only land in the hands of the people, which is holding what the capitalists need. Xolobeni is not fighting the South African government and the Australian Company, but the whole capitalists system designed to benefit only the few at the expense of the masses. What needs to be put out there is that imperialism failed to conquer this land and still today the AmaMpondo Land people are still defending their land. Hands-off to the ACC leaders! No mining in our Land! Siyawina!